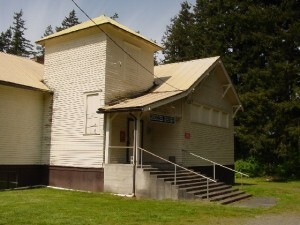 The Forest School was part of the Yelm School District by 1915. 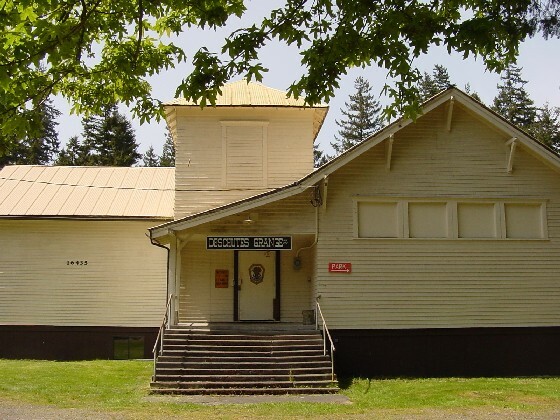 Located on the corner of 143rd SE and Vail Road the building still stands and is known as the Deschutes Grange. 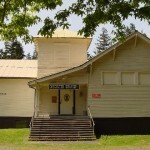 From this picture one can see the closed bell tower that was always part on the small schools of the era. Located where it is, the building may have been part of an earlier school district that was absorbed by Yelm. 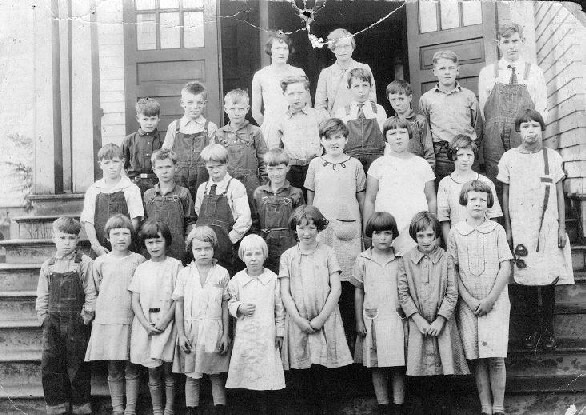 This picture of the Forest School, from Yelm Pioneers and Followers, 1850-1950, is from 1915. 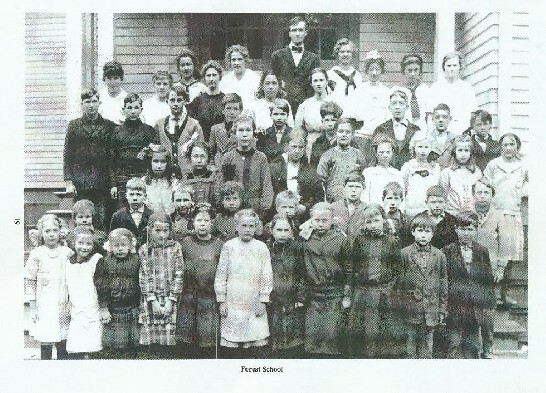 The teachers in the picture, Mr. Loren Peters and Miss Ruth Eide were on the Yelm school district payroll in 1915. Also in this picture are two of the three Chabert girls. They became educators. Not in the photo is their sister Rose, who also became a teacher. 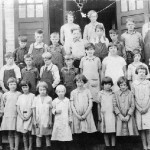 According to Joseph Conine, in a 1917 letter to his daughter Jennie Lind Edwards, “the Forest school is also looming up pretty well.” A “Miss Curry” was the principal and May Robinson was her assistant. The entertainment goven recently aby the pupils of the Forest school at McKenna and witnessed by quite a few peple from this town was a big success, netting the school $18.50 to be appliaed on the purschase of piano and gving the attendants a most pleasant evening. A literary society was organized last Friday evening iat the Forest school. A short program was rendered and there was a debate between Mr. J. C. Conine, R. F. King, and Mr. Peters and R. S. Smith. The subject discussed was, “Resolved, Tat the United States should own and maintain a merchant marine.” This was enjoyed by everyone present. There literary meeting will be held every two weeks and promises to be both instructive and entertaining and should have the co-operation of everyone in the district. The Forest school hot lunch, which was organized by William H. Dunham, county club leader, January 12, has proven a great success under the supervision of Miss Mary Curry and Miss Bessie Evans. The lunch is cooked Ly a club organized or pupils over ten years of age and the children bring all or the food themselves except staples. Before the hot noon lunch was opened a big social was held one night which resulted in $42.67 being secured to start the work. Now the children sit down for 20 minutes and eat a good hot lunch before going to play while formerly they swallowed a cold sandwich, and then out to spend the rest of the noon hour playing. A survey was taken before the lunch was opened and 15 or the 42 were found to be overweight. Since then 1 has gained 5 1/2 pounds, another 4 1/2, while 4 others have gained 2 pounds and many others one pound. No charges are made for the lunch but every one brings what he can. In the past month 37 servings of hot drinks and food” were made, totaling 1375 cups. These contained 3 3/4 pounds of butter and 120 quarts of milk.